Today, we were grateful to welcome additional saints in our midst. Sylvia Poggioli, senior European correspondent for NPR; Kate McElwee, executive director of Women's Ordination Conference; Zuzanna Flisowska, general manager of Voices of Faith; and Luke Hansen, S.J., a one-time FutureChurch intern and now student in Rome joined us for the day. We also had the amazing experience of mass in the Catacombs of Domatilla -- the largest of the catacombs in Rome. Veneranda (4th Century) was buried here, close to the grave of Petronella (1st Century). Notice the open capsa (the basket containing the scrolls of Scripture), which indicates that Petronella was remembered and venerated as a woman of the Word. 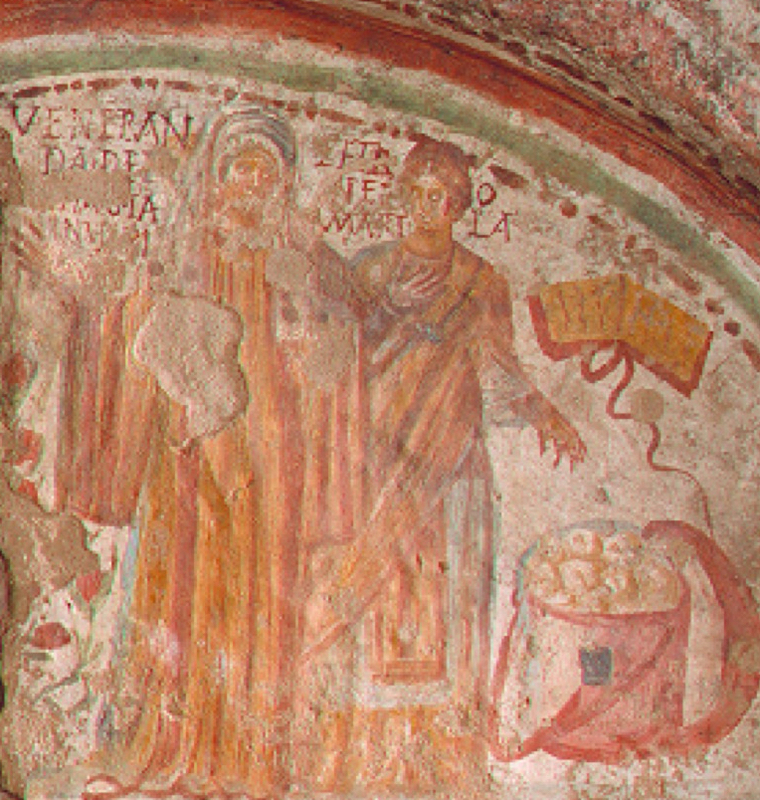 Veneranda certainly had a strong devotion to this early Christian woman as she chose to evoke her memory in this fresco. Given the community that we've built and all that we've learned, discussed, and explored over the week it was certainly a moving experience to celebrate mass together and to do so in this space. 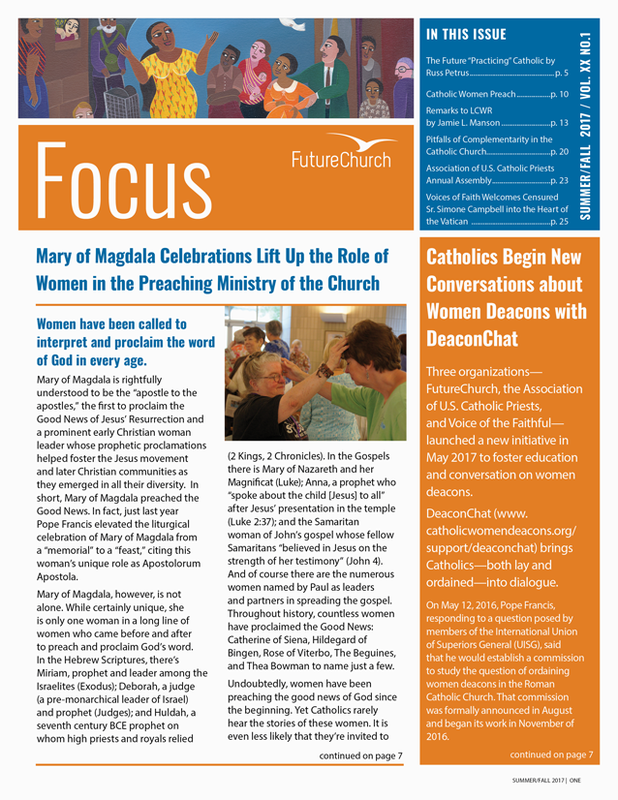 Indeed, the best way to describe our celebration together is that it was both "source" and "summit" -- just as the Second Vatican Councils tells us it should be. We have all heard the parable of the prodigal son more times than I imagine we can count. Modern day interpretations error on the side of patronizing, as we are over and over again told how foolish, wasteful, sinful, and in need of mercy we are, from so many of our dear brother clerics at the pulpit. Perhaps many of you have already thought in these terms that I am about to propose. But in case you haven’t I’d like to offer a different take on things. What if it’s not us who are the prodigal ones? Not us, but our church leaders who are the prodigal sons? What if it is they who have been foolish, wasteful, sinful, and in need of mercy? Like the prodigal son, many of the leaders of our church have lost themselves in a distant country, an elitist, protectionist, boys-club culture that does not recognize the priorities of Jesus, nor his message of radical acceptance, mercy, and love. Like the prodigal son, our church has hired out its services to the highest bidder. We more commonly refer to this as politics. And while the prodigal son went hungry as he fed and cared for someone else’s swine, our church finds itself providing communion and Eucharist, memory and gratitude, for others, which it itself has not tasted in fullness for a very long time. Unlike the prodigal son, many of our lost brother clerics have not found their way back to us. Few have come repenting the pain they have caused, the gifts they have squandered, the grace they have denied. No matter. We are still here. The Jesus movement, as Gene might say, is alive and well, but the leaders of our Church have gone astray. As we have seen time and again throughout our pilgrimage, throughout our studies, throughout our lived experiences, our brother clerics have taken the money, the riches, the wealth, and the credit and run. How do we invite these our brothers back into fold? What will the day look like when we see them dotting the horizon, slowly making their way back home to us? I have to admit, I’m not sure I’ll be much more impressed than the older brother in the story. I definitely don’t foresee a rom-com-esque running through the fields to embrace each other kind of scene. Will I be willing to forgive them for the hurt and heartache they have caused me? Let alone drop everything I’m doing and throw them a party. I think this is where maintaining communities like the one we have formed here will be vital. We can come together to welcome our lost brothers, to bring them back into the fold. We can remind each other of the magnanimous love to which we are called, the example of mercy and love we have in our God, and the yearning for peace that is part and parcel of who we are. And we can remind each other to be nice to our prodigal brothers. Instead of demanding that we are given the share of the estate that we are entitled, as so many of our brother leaders have, we can remind each other that the feast is richer when shared together. We the church, and the church our brothers can mourn together the lost moments, all of the time we spent estranged from each other. And then, trusting that what God provides for us will be enough, we can all pull up a chair and share in what would truly be a heavenly banquet.